Question 1: In electronic versions of spring scales, the deflection of a beam supporting the unknown weight is measured using a strain gauge, which is a length-sensitive ________. Scales used for trade purposes in the State of Florida, as this scale at the checkout in a cafeteria, are inspected for accuracy by the FDACS's Bureau of Weights and Measures. 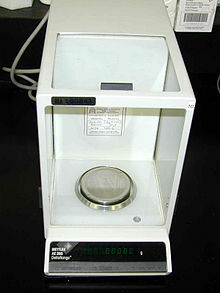 Mettler digital analytical balance with 0.1 mg precision. Digital kitchen scale, a strain gauge scale which works by the spring principle. An old two pan balance. Question 3: Although a balance technically compares weights, not masses, the ________ of an object is proportional to its mass, and the standard weights used with balances are usually labeled in mass units. Question 4: The scales (specifically, a two pan, beam balance) are one of the traditional symbols of ________, as wielded by statues of Lady Justice. Question 5: These scales are used in the bakery, deli, seafood, ________, produce, and other perishable departments. Balance with a counterweight to small objects weighing 0-100 grams. A precision balance scale for weighing silver and gold located on display at the Historic Archive and Museum of Mining in Pachuca, Mexico. Question 8: Spring scales measure weight, the local ________ of gravity on an object, and are usually calibrated in units of force such as newtons or pounds-force. A spring weighing scale can measure forces transmitted through the scale in any direction. Question 10: A weighing scale (usually just "scales" in UK and Australian English, or "scale" in US English,) is a measuring instrument for determining the weight or ________ of an object.